For pioneer children, a day without work was a special day indeed. So on her tenth birthday Kirsten was allowed to leave her chores behind and join her friends for a day of fun. 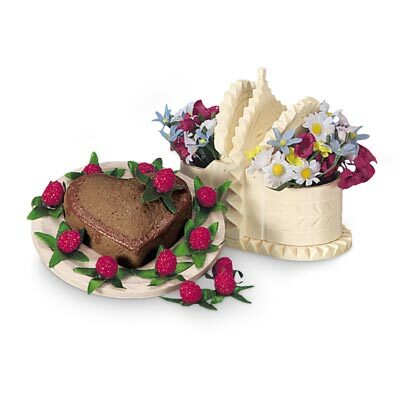 Re-create Kirsten's birthday celebration with a hand-carved wooden salt box brimming with field flowers, lots of plump strawberries, and a heart-shaped cake on a wooden platter, just like Mama made. Originally this set also included the Quilt Kit (as KBAP). That part was moved to the Friendship Quilt set in 1998.